Calchas was one of the most famous and important seers from Greek mythology. Calchas was the primary seer of the Achaean forces during the Trojan War, providing guidance and counselling to Agamemnon. Calchas was the son of another seer, Thestor, possibly by a woman named Polymela, making Calchas brother to Theoclymenus, Leucippe and Theonoe. The family line of Calchas made him a great-grandson of the god Apollo, hence the prophetic power of Calchas. Little is said about the early life of Calchas but the reputation of the seer was widespread prior to the Trojan War, for it was widely recognised that Calchas was unbeatable when it came to Augury, prophecy from the flight of birds, whilst he was also highly skilled in divining the future from other forms of wildlife. Such was the reputation of Calchas, that Agamemnon, the commander of the Achaean forces, specifically travelled to Megara to recruit the seer, prior to the Gathering at Aulis. Even before the arrival of Agamemnon Calchas, had by this time, already made his first prophecy concerning the upcoming Trojan War, for the seer stated that the Trojans would not be bested unless Achilles fought for the Achaeans. This prediction would see Odysseus go to the court of King Lycomedes on Skyros to find the hidden Achilles. The next important prophecies of Calchas occurred at Aulis, where the Achaean forces were gathering. The first saw Calchas predict how long the forthcoming Trojan War was to last. Calchas observed a serpent eating eight baby sparrows followed by their mother, after which the serpent itself turned to stone. Seeing 10 different creatures involved in the event, Calchas predicted that 10 years of war was to follow. Ten years of fighting was not something that the Achaean leaders wished to hear, but the second prediction made by Calchas was even more unpalatable. With the Achaean fleet ready to set sail for Troy, ill winds kept the fleet at anchorage. These ill winds were probably sent by the goddess Artemis, with Agamemnon normally blamed for angering the goddess. 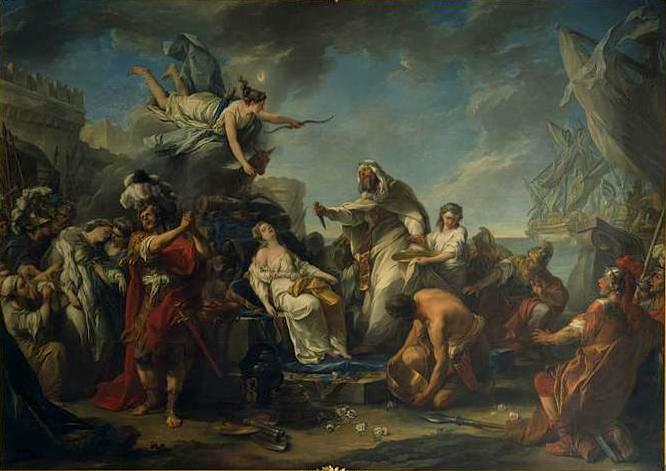 It was Calchas who informed Agamemnon that the winds would not become favourable until the fairest of Agamemnon’s daughters, Iphigenia, was sacrificed to the goddess. Now whether Agamemnon was willing to go along with the pronouncement of Calchas, or not, matters little, for Clytemnestra and Iphigenia would be summoned to Aulis, and eventually Iphigenia ended up on the sacrificial table. Then Calchas was tasked with committing the killing blow to the daughter of Agamemnon. Calchas was perfectly willing to undertake the sacrifice, although in many tales, Artemis rescued Iphigenia before she died, substituting a deer in her place. The Achaean fleet would eventually arrive at Troy, and the war raged on and on. Calchas would be found by Agamemnon in the war, counselling the Achaean commander in decisions, both militaristic and non-military decisions. Agamemnon though, once again angered a Greek god, this time Apollo, when Chryseis, the daughter of Chryses, a priest of Apollo, was kidnapped; and Agamemnon refused to ransom the woman. In retribution, Apollo sent forth pestilence upon the Achaean army. Calchas knew the reason why pestilence had come upon the army, but was fearful of the wrath of Agamemnon if he should reveal it, and the method of removing it. Achilles though, swore to protect Calchas, and so the seer once again delivered bad news to Agamemnon, for the Achaean commander would have to release Chryseis. The words of Calchas did come true, for when Chryseis was released, the pestilence left the Achaean army. Yet still war raged on, and even though the war was now in its tenth year, the war seemed no closer to ending. Calchas then made another prophecy about the conditions for victory, and this time the bow and arrows of Heracles were required. These implements of war though, had been left behind on Lemnos, when Philoctetes had been abandoned in the island. Diomedes and Odysseus were dispatched to retrieve them, and they also brought back Philoctetes with them. The importance of Calchas to the Achaean forces perhaps diminished subsequently though, for Calchas was not the only seer who was prominent during the Trojan War, for on the side of the Trojans were Cassandra and Helenus; and following disagreements, Helenus would leave Troy and arrive amongst the Achaean forces. It was generally considered that it was Helenus who then revealed the final requirements for Achaean victory in the war, with the bone of Pelops, the removal of the Palladium, and the skills of the son of Achilles all required. The original prediction of Calchas, for the Trojan War to last ten years did come true, for the subterfuge of the Wooden Horse saw Troy fall to the Achaean forces, and despite not being a fighter of note, Calchas is normally said to be amongst the heroes hidden inside the belly of the horse. After the war had ended Calchas travelled through Asia Minor, with several minor Achaean heroes. Eventually, the group arrived in the city of Colophon, where they were made welcome by the seer Mopsus. Now this meeting would be important, for a prophecy had been made about the death of Calchas; for it was said that when Calchas met a superior seer death would come to Calchas. Mopsus was the son of Apollo and Manto, and when the two seers met in the Grove of Apollo, a contest commenced between the two seers. Details of the contest vary between ancient sources, but a prominent version sees Calchas and Mopsus predict the number of figs upon a wild fig tree. The prediction of Mopsus proved to be exactly right, with the son of Apollo also telling of the number and size of containers needed to house the picked figs, something that Calchas had been unable to do. Knowing he had been bested, Calchas shut his eyes, and died. Alternatively the predictions were made not about the number of figs, but on how many pigs were to be born, to a pregnant sow, and again Mopsus proved to be correct, whilst Calchas was wrong. A third possible reason for the death of Calchas was a prediction dealing with the life and death of Amphimachus, a Lycian king. Mopsus told the king not to go to war, for defeat would results, whilst Calchas saw only victory for Amphimachus. The king went to war and was defeated, and thus Calchas killed himself. One final tale of the death of Calchas does not involve Mopsus, but instead comes about because of the prediction of another, unnamed, seer. Calchas had planted a number of vines, but the other seer predicted that he would never drink wine produced for them. Grapes were picked form the vines and wine was made though, and so Calchas invited the other seer to the first tasting. Calchas lifted the wine glass to his lips, and started to laugh, now believing that the prediction was totally false, the laughter caused Calchas to choke, and so the seer died before he drank of his vines. Colophon is not always the location for the death of Calchas, and alternates are given, either in the nearby sanctuary of Claros, or else in another city of Asia Minor, Grynium. It was though, generally agreed upon that Calchas was subsequently buried in Notium, a port city for both Colophon and Claros.